A wasted opportunity to tell in filmic terms two important histories: the crimes of apartheid and the love with which they were answered. 104 min. Sony Pictures Classics. Director: John Boorman. Cast: Samuel L. Jackson, Juliette Binoche, Brendan Gleeson, Menzi Ngubane, Sam Ngakane. With the opening title of In My Country (set to the invitingly lush African vocal "Senzenina"), John Boorman sets the expectation that the film will present true stories from South Africa's Truth and Reconciliation Commission, a post-apartheid airing of human rights abuses. Because the promise of these stories is only nominally fulfilled by Boorman's movie, audiences are likely—as I did—to compare the film they get to the one Boorman might have made. Instead of bringing the real stories to life through flashback, Boorman uses them as spice to his real story: the reactions of two journalists. Juliette Binoche plays Anna Malan, a character based on Antjie Krog. A poet turned reporter, Krog wrote Country of My Skull, the book on which In My Country is based. Samuel L. Jackson plays Langston, a Washington Post reporter who develops feelings for Anna. Taking the polar opposite approach to Peter Weiss's play The Investigation, Boorman and screenwriter Ann Peacock offer only bite-size chunks of testimony. Boorman brushes against one provocative idea—the individual's responsibility in the face of injustice—but the approach is simplistic and dramatically clunky. "Remember where you're from, Anna," her father warns. The sinister "white man's burden" racism of Anna's family is a stock element of the screenplay, as familiar as the hollow defense "I was only following orders" and Anna's frustrated, directionless guilt. The banter of testy Jackson, sad Binoche, and their quipping compadre Dumi (Menzi "Ngubs" Ngubane) prods the story through its "set against the back drop of" romance; the equally reliable Brendan Gleeson, playing a police colonel facing charges, likewise is steered to simplistic overacting. However well-meaning, In My Country comes off as a wasted opportunity to tell in filmic terms two important histories: the crimes of apartheid and the love with which they were answered. 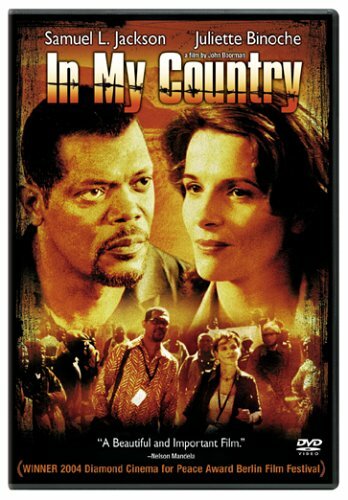 Sony's DVD of In My Country offers a chance for a reevaluation (or a first look) at Boorman's film. The director delivers a steady stream of screen-specific commentary on the film ("an extraordinary experience for me"), including his intent, his first-hand knowledge of the apartheid era, and anecdotes and insights into his actors. Boorman discusses why Juliette Binoche beat out Charlize Theron for the leading role, how Binoche shadowed author Antjie Krog, the impact of digital processes on filmmaking, the meaning of the film's music, and his meetings with Desmond Tutu and Nelson Mandela (and how In My Country is one of the only feature films Mandela has ever watched). Boorman also answers the film's critics by justifying the romance, as a literal compensation for the pain of the proceedings and an allegorical expression of harmony restored after apartheid. The disc's surprisingly thorough special features include interviews with Binoche (5:20), who elucidates her give and take with Boorman; Boorman (12:24), who explains his preference for rehearsal; screenwriter Ann Peacock (16:33), who explains her choices of adaptation and Hollywood resistance to the project; producer Robert Chartoff (13:05), likewise frank about the untouchable material and Tutu's unwillingness to view the finished film (so as not to relive painful events); producer Lynn Heyman (15:58), who shares an anecdote about serendipity on the set; and Hollywood mover and shaker Mike Medavoy (7:45), whose relatively terse interview puts the film in perspective of his 323 movies, while answering the critics. The disc includes four deleted scenes, each with director's commentary: "Langston in Washington DC," "On the airplane," Listening to the radio," and "The flow of time." The scenes mostly involve Samuel L. Jackson, whose exposition was understandably crowded out by a focus on Binoche's character. Previews for Kung Fu Hustle and Layer Cake round out the disc. Though the contrast seems a bit weak (shadows are grey), the film's transfer is generally quite good, and film-like in appearance. The soundtrack on the film sounds great, but the audio on the video interviews varies, with Boorman's interview conspicuously low. On the whole, this is a pleasantly detailed special edition for a small film, and certainly enhances the experience of In My Country. All site content © 2000-2019 Peter Canavese. Page generated at 04/25/2019 03:33:06PM.